FORT WORTH, Texas - As her boyfriend Thomas Eric Duncan lay dying of Ebola in a Dallas hospital bed, Louise Troh battled loneliness and fear that she too had contracted the disease while confined to a stranger's home under armed guard. Troh's confinement ended Sunday night, along with several friends, family and others who had contact with Duncan after he first became infectious. Ebola has a maximum 21-day incubation period, and the people who interacted with Duncan after he first arrived in Dallas from Liberia should now be in the clear. It's an important milestone in the nation's efforts to contain the outbreak and a cause for celebration for Troh. After three long weeks, she will able to have a clean bill of health, leave the house and be done with twice-daily temperature readings by government health care workers. She likened the period to being a prisoner. "Our happiness is mixed with sadness at the same time," Troh said in a statement. "My beloved fiancée, Thomas Eric Duncan, who was also the father of my son, Karsiah Eric Duncan, did not survive with us. We continue to mourn his loss and grieve the circumstances that led to his death, just at the time we thought we were facing a happy future together." Troh told the Associated Press she and Duncan planned to get married the same week his funeral was held. The future for Troh and her family are uncertain as the stigma of Ebola is likely to follow them into whatever future plans they may have. Bloomberg News reports a new-apartment deal was broken after Troh had already made a deposit. Sources told Bloomberg people are reluctant to rent to them due to her proximity to the disease. Troh's pastor, George Mason, told CBS News correspondent Vicente Arenas they have struggled to find new housing for her. "We have done some preliminary research to see if some apartment complexes would be open to them and the response has been tepid to be honest," Mason said. Reverend Edwin Lloyd, who leads a small, predominantly Liberian church in Beltsville, Maryland, told CBS Dallas all Liberians are experiencing a degree of the stigma likely to follow Troh. 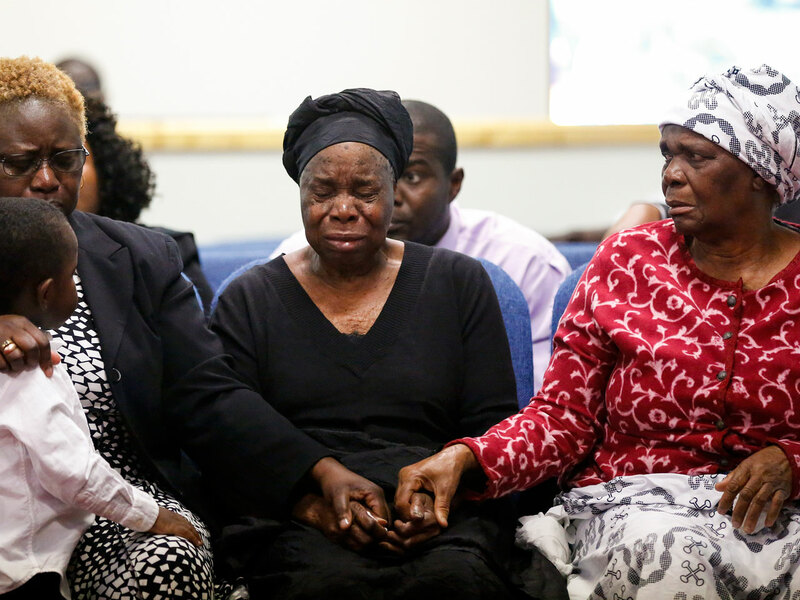 From refused handshakes to other congregations avoiding them, many in this community feel ostracized at a time when their loved ones are suffering and dying in Africa. "I think it's dehumanizing, basically," Lloyd said. "Liberians and those in West Africa who are from the afflicted countries are going through a time of traumatization. And being stigmatized increases the trauma that we experience as a people." Duncan arrived in Dallas from Liberia in late September and went to the hospital complaining of headache and stomach pain. He was sent home with a prescription for antibiotics to treat a misdiagnosed sinus infection. Between the time he was first released from the hospital and when he was readmitted into a quarantine, Duncan is believed to have come in contact with dozens of people, including many school-aged children. When Duncan returned two days after first leaving the hospital, he was diagnosed with Ebola and died Oct. 8. The day Duncan tested positive for Ebola, Troh, her 13-year-old son, Duncan's nephew and a family friend were ordered by a Dallas court to stay inside the apartment among Duncan's used linens and any lingering virus. The unusual confinement order was imposed after the family failed to comply with a request not to leave the apartment, Dallas County Judge Clay Jenkins said. The four were later taken to an undisclosed gated community. Officials say 125 friends, family, doctors, nurses, technicians, ambulance drivers and others may have been exposed in the days before Duncan died on Oct. 8. Since then, two nurses have tested positive and at least 18 other people in Texas and Ohio have been identified as secondary contacts who also merit watching. But different hospital workers had different levels of monitoring, based in part on their exposure risk. Some self-reported some temperatures. Some continued to care for patients. Jenkins and Troh's pastor George Mason delivered the news of Duncan's death to her during the confinement period. The other people who will have their quarantine period end at midnight include Youngor Jallah, Troh's daughter, a nurse's assistant who checked Duncan's vital signs before calling for an ambulance. For nearly three weeks, Jallah has not left the cramped, second-story apartment she shares with her partner, Aaron Yah, their three children, ages 2, 4 and 6, and Yah's 10-year-old son. Unlike Troh, Jallah was not prevented from leaving by an armed guard, but Centers for Disease Control and Prevention officials have come by daily to check everyone's temperature. "I'm telling you, just to step outside will be so great. To hug my mom and grieve for Eric, not over the phone like we've been doing but in the flesh," Jallah said. Mason said he is coordinating efforts with the city, county and philanthropic community to help Troh and the family recover. Because of the Ebola infection risk, crews stripped Troh's apartment down to the carpeting, saving only a few personal documents, photographs and a Bible. "They were left with nothing. They are completely devastated by this, so there's need to have their lives rebuilt," Mason said. Troh plans to partially recover financially with a book written about her life, from growing up in Liberia, meeting Duncan in a refugee camp in Ivory Coast, Duncan's years-long quest to come to America to be reunited with his girlfriend and their 19-year-old son, and his death in an isolation ward. "It will be a love story," she said. "We look forward to welcoming Louise and her family members back to church after the quarantine is lifted and we want you to know that when that happens we will be glad to receive each one of them," he said.